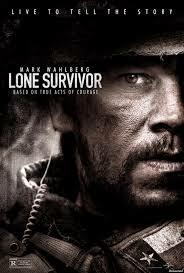 Last night we watched Lone Survivor, the true story of how Navy SEAL Marcus Luttrell became the lone survivor of an operation gone horribly wrong. The movie is action packed yet it also hits your emotions hard. The firefight scenes are intense and the firing doesn’t stop until the very end. The story is quite remarkable and I highly recommend it. This entry was posted in Movies and tagged Lone Survivor, Marcus Luttrell, Mark Wahlberg, movie, Movies, Navy SEALs, Operation Red Wings. Bookmark the permalink. Good review. The focus on the soldiers is what makes this a lot more emotional and compelling to watch, especially when their lives are half-a-second away from ending.